Points of this type are often called focal points. The idea is that on the boundary of Black's framework and White's framework, a play by Black will improve Black's framework and at the same time reduce or threaten White's framework. Therefore these points are big because they are double-purpose plays. They are often played in the opening as secondary big points (and are frequently the solution to whole-board problems with quiet positions). See Strong Groups for an example and discussion. 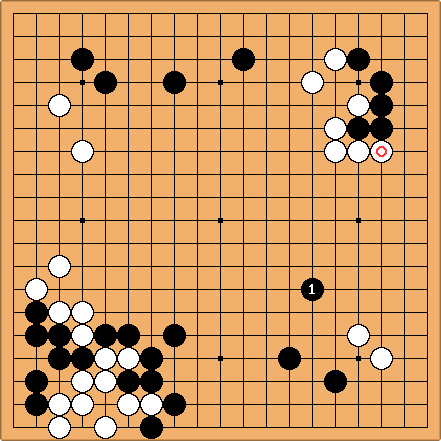 Game played 1927-11-25: Go Seigen as Black played at 1 in reply to the marked white stone blocking off the side. This is considered both excellent timing, and a clear-sighted focal play (Black has no need to invade on the right). Quite a move for a thirteen-year-old to come up with. Go Seigen was still in China at the time. Comment: That seems strange to me. There is nothing focal about such points. They are not at any focus, but at the frontier between moyos. I would call them frontier points or boundary points. Charles Actually, as I now realise, such parts of the board should have many sector lines converging on them; in that sense they are focal or nodal. Bill: (Much later.) I have found a term I like better, contact point (of two moyo). And I do not think that such points have sector lines converging on them. The example certainly does not. Bruce Wilcox I prefer the term "pivot point" as they are a fulcrum, shifting the balance of growth and withering of two moyos. Patrick Traill (2019-03-12): Perhaps the idea is that they are where conflict is focussed? Chambers Dictionary gives “the point or region of greatest activity or interest” for focus, and this seems to be closest to the Latin meaning of hearth. (This sense is lacking in Wiktionary.) Surprisingly an older, historically ordered edition of Chambers does not give this as the first sense and my OED is too deeply buried for now.